Marc Marquez took a sensational victory at the Motul GP of Japan at Twin Ring Motegi on Sunday, becoming the 2018 MotoGP World Champion with three races to go. After starting from the sixth place on the grid, he made a brilliant start and was soon involved in a race long battle with title contender Andrea Dovizioso on the GP18 Ducati and fellow Honda rider Cal Crutchlow. With two laps remaining, the Ducati riders slim title chance disappeared as he tucked the front at turn 10 crashing out of the race, just after Marquez had passed him to set up a last-lap duel. With his pit crew urging the 25 year-old to slow down the young Spaniard celebrated his title win with a massive wheelie across the line before even more elaborate celebrations began on the slowing down lap. With his eighth win of 2018 and the 69th in his career (across all classes), Marquez becomes the youngest rider of all time to reach the milestone of seven World Championships (125cc in 2010, Moto2 in 2012 and MotoGP in 2013, 2014, 2016, 2017 and 2018). Behind the newly crowned champion British star on the LCR Honda held off a determined Alex Rins on the Team Suzuki Ecstar for second while Valentino Rossi brought the Movistar Yamaha home in fourth after Andrea Iannone crashed out on lap 14 at turn 10. “I feel really, really good. I would say it’s a dream came true, or better, that I’m living a dream," said Marquez. "It’s something so special, here together with my team, all the Honda and HRC people, my family and my staff. It has been a great season, and ever since Aragon I’ve been, tasting, imagining this title, because it was very close. "Then I realized that this wasn’t my style, and I needed extra motivation, so I set the goal of trying to achieve it with my first match ball in Motegi, by winning the race. This circuit was a challenging one to manage that, but it seems like when I’m under pressure, I feel better on the bike! Today the race was as I expected. "I was prepared to make a good start and immediately make some passes. I got to second place at the end of the first lap, and then was able to follow Andrea and stay with him. I thought I could try and attack before the last lap because I felt I had something extra to give. "He was pushing very hard and made a mistake, and that’s a shame because he deserved to be here on the podium. That’s also something that I think Dani (Pedrosa) would deserve at least once this season. Anyway, when I crossed the finish line it was an explosion of joy. Cal Crutchlow added: “We’re pleased with the result at Honda’s home raceand the team’s done a fantastic job. The problem we had was that Dovi (Andrea Dovisioso) kept slowing down the pace so it allowed the people behind to catch up, but I think we did a great job managing the situation. Alex Rins was pleased with his podium saying: “We did a great race. After Andrea crashed I assessed the situation and thought Crutchlow might be too far in front, but I decided to try and catch him. But it was difficult to pass him because he was braking really hard. Finally we got third and we're so pleased. We'll try to end this season with more podiums!" Fabio Quartararo produced a quality ride to seal his second victory of the season as he held firm to beat Championship leader Francesco Bagnaia with Lorenzo Baldassarri claiming third on his 100th Grand Prix start. 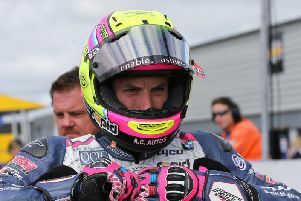 After the race however the French rider was disqualified as his Speed Up machine’s tyre pressures were under the minimum required. That gave Bagnaia another impressive win for his tally and inches him closer to the crown. In the Moto3 class Jorge Martin’s lead in the series was cut to one point after he crashed out of the race and Marco Bezzecchi took a stunning victory, his third of the season as he beat Lorenzo Dalla Porta and Darryn Binder on the run to the line.